A crowd that included Mayor Bill Peduto and Pittsburgh Parks Conservancy president and CEO Jayne Miller gathered this morning in Allegheny Commons to break ground on the rebuilding of the historic Northeast Fountain at Pittsburgh’s oldest park. The Commons was designed in 1867 to create “breathing places” for the residents of what was then Allegheny City. The goal in rebuilding the park’s dramatic fountain and the area around it is much the same: Not just to beautify the park, but to create an outdoor public gathering space for the whole community. 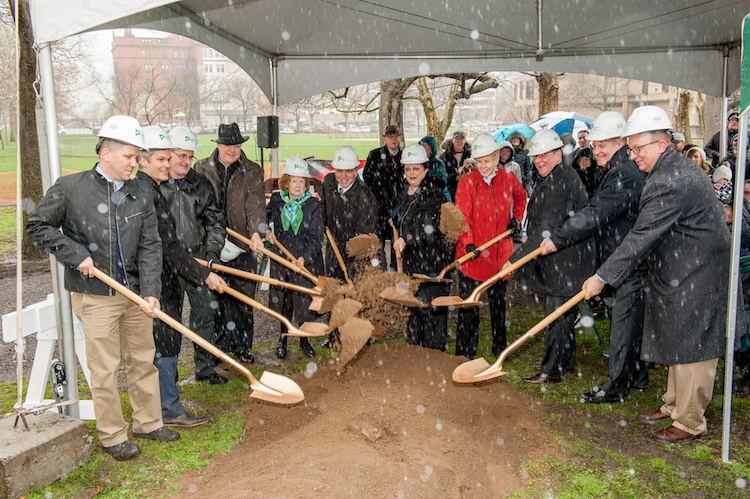 Despite the weather, today’s groundbreaking drew more than 100 attendees. Photo by Joe Riebling. The rebuilt fountain will mirror the original 19th-century design, including a 50-foot circular stone basin, a rim of heavy cast stone, a large Grecian-style vase in the center, a tall principal jet and 16 smaller jets. Beyond it, in a return to the park’s original design as a Victorian landscape for strolling and relaxing, a garden with walkways, benches and lighting will be added. The park has been revised and remodeled more than once since its creation in the 19th century. In the 1930s, the path system was modified and play areas were added. In the late 1960s, landscape architecture firm Simonds & Simonds proposed updates that included Lake Elizabeth. Allegheny Commons was listed on the National Register of Historic Places in 2013. The Allegheny Commons Master Plan, completed in 2002 by the Allegheny Commons Initiative, included the Northeast Fountain work as the third of a series of projects. The post Restoration of northeast fountain at Allegheny Commons will create a public gathering spot appeared first on NEXTpittsburgh.